Jorge Posada and Andy Pettitte are retiring their jerseys this weekend at Yankee stadium. With an average resale price of $87 for Saturday’s Posada retirement, and $96 for Pettitte’s retirement, the two games are the seventh and ninth most expensive Yankee home games this season, only trailing match-ups with the Red Sox, Mets and the season opener against the Blue Jays. Despite the Cleveland Indian’s struggles this season, the chance to see the ceremonies for Jorge Posada and Andy Pettitte still has fans flocking to the ballpark, as the games are more expensive than 89 percent of the Yankee home games this season. Sunday’s game, with an average resale price of $96, is the seventh most expensive game this season, while Saturday’s with an average resale price of $87, is the ninth most expensive. 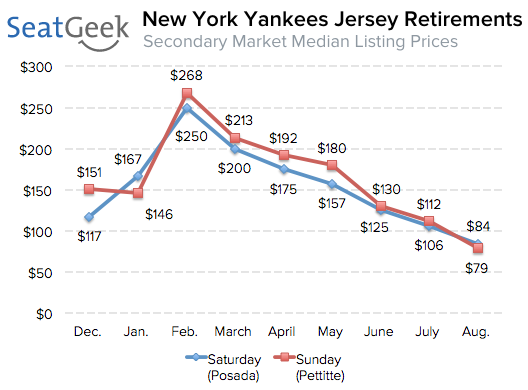 Following the announcement in February of the jersey retirement ceremonies, the median listing prices for both games skyrocketed to above$250 a ticket. However, as the game has approached the demand for tickets has seemingly cooled off, as the median listing currently for Saturday’s game is $84, and Sunday’s game is $79. Even just a week ago the median listing price for both games was more than $100, so the fans who waited until now to buy tickets will save a good amount of money. The Yankees also retired Bernie Williams’ number earlier this season, on May 24. Tickets to that game resold for an average of $58, far below the numbers we are currently seeing for Posada and Pettitte. However, five days out from that game the average resale price was $73, showing that there was also a late drop in resale prices. For comparison, the average resale price to the Red Sox game where they retired Pedro Martinez’s jersey last month was $79. Overall the Yankees have the second most expensive secondary market tickets in baseball, with an average resale price of $67. This only trails the Red Sox, who have an average resale price of $69. This Yankees average is down from a year ago, when at this point in the season the Bronx Bombers had an average resale price of $87 per ticket.